Wind is a constant force in the region where we relocated to in 2016. It can come as a gentle breeze or as gale force gusts. It can make rain literally hammer against the windows, and it will – without mercy – blow the garden’s plants to pieces be it roses or hydrangeas or ornamental grasses. Sometimes it even makes itself heard when it speeds along the red brick walls of the old farmhouse blustering. In summer it might join up with hail. Last winter it carried the bitterly cold from the east. Thus it will come with no surprise, that the first book I made in the new place is all about wind. It is a collection of sayings, poetry, prose and facts about wind, blown together from all corners of the world. Mankind has had to deal with wind and its effects ever since. The sayings of peoples from around the globe show how they encountered wind and what experiences they made with wind. The book also tells of the Beaufort scale of wind forces. The design of the layout resembles texts blown together from everywhere as if they had been carried by the wind and dropped into the book. Amongst the authors are Robert Louis Stevenson, Abrahem Lincoln, and also poets like Homer, Rilke, Storm or Whittier. It tells about the ancient Greeks’ gods of wind, too. The book is the fourth issue in the Manarah series, of which the first three issues have been published in 2011 as contribution to the al-Mutanabbi-Street Inventory Project. 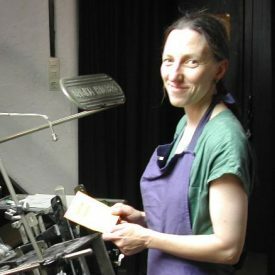 Manarah is a series of magazine-like artist’s books, printed letterpress with woodcut and/or linocut illustrations. Every issue of Manarah is dealing with one theme. Manarah 4 comes with seven linocut illustrations. Texts are partly in English and partly in German. All German texts have been translated into English and these translations come in an extra brochure. The book itself is a single section pamphlet stitch binding with 16 pages. 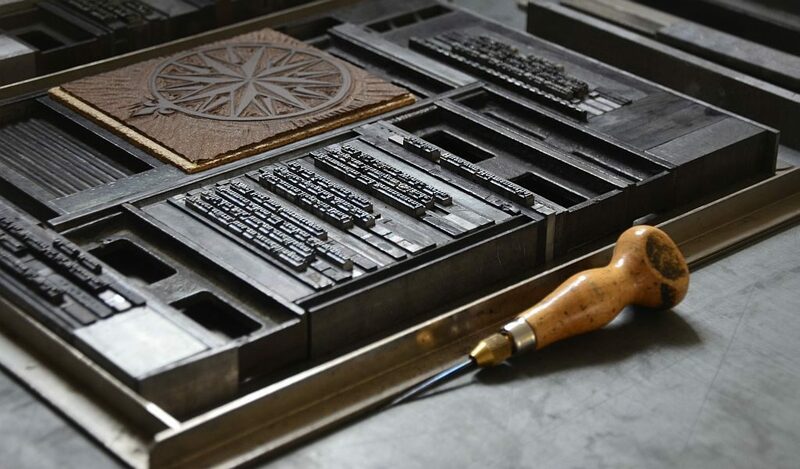 The text is printed in a light grey on white Rives Basane paper of 170 gms. 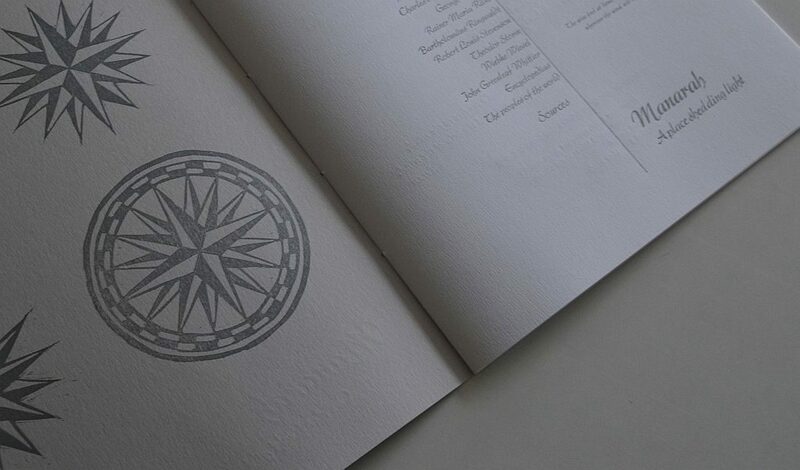 The cover is printed on silvergrey Rives tradition paper of 250 gms. 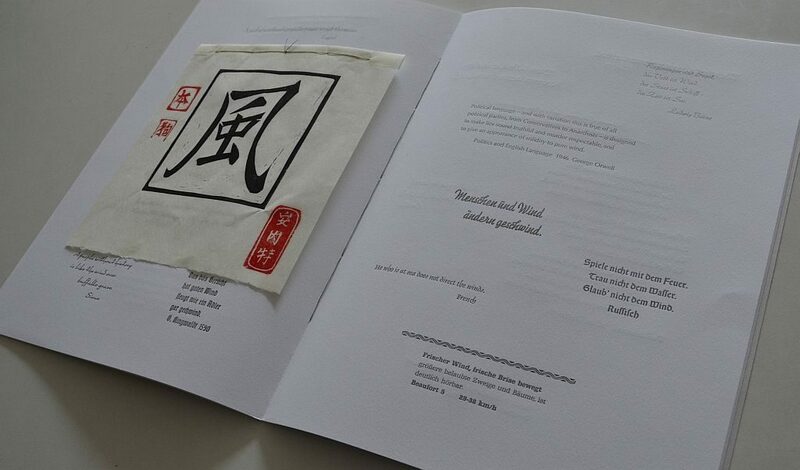 The Chinese character is printed on delicate Japanese paper. The book is published in a limited edition of 20 numbered and signed copies in 2018. 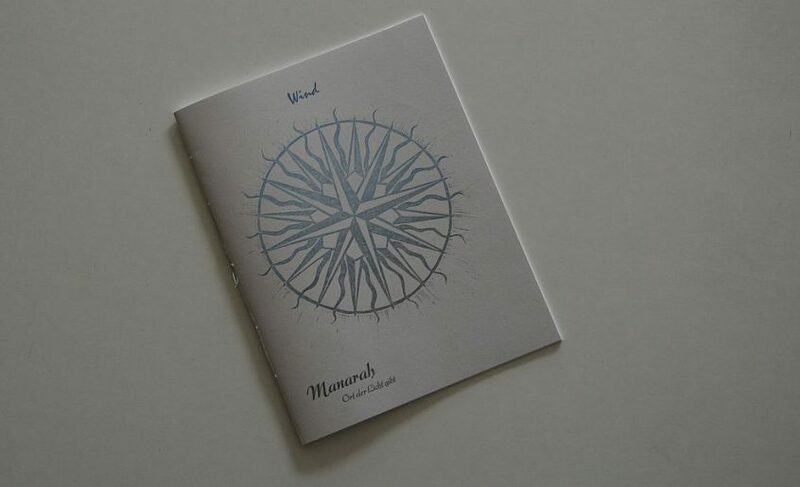 „Manarah 4: Wind“ was awarded the Oxford Guild of Printers’ prize for best single section binding at the 2018 Oxford Fine Press Book Fair. PS: Manarah is an old Arabic term for a place shedding light, such as a lighthouse. It was used for road signs and any sign helping to give orientation on one’s journey. It later developed into the term minaret.